Start their day in the best possible way! This generous basket is equipped with everything needed to create a decadent spread of gourmet brunch favorites that your recipient will find impossible to resist. Complete with slowly smoked pepper bacon, organic English breakfast tea, and a mix for delightfully fluffy pancakes, this stunning arrangement makes any morning completely unforgettable. Hickory Smoked Pepper Country Bacon by Broadbent's - 14 oz. - Irresistible award-winning bacon that's rubbed with a special blend of pepper and then slowly smoked. Blueberry Crisp Mix by Fowler's Milling Company - 16 oz. - A delightful mix of all-natural ingredients that creates a classic breakfast treat with the addition of a few ingredients. Farmhouse Pancake Mix by Stonewall Kitchen - 16 oz. - A blend of sweet vanilla and malted flour that easily creates fluffy pancakes and light waffles. Pure New Hampshire Maple Syrup by Fuller Sugarhouse - 3.4 oz. - Grade A Dark Amber maple syrup that's won awards for its clarity, density, and perfect flavor. Wild Maine Blueberry Preserves by Clearbrook Farms - 10 oz. - An elegant and vibrant spread made from the freshest wild Maine blueberries. (2) Perfect Potfuls Assorted Gourmet Coffees by Coffee Masters - 1.5 oz. - Packets of freshly roasted gourmet coffee that are carefully measured out to create the perfect strength brew. Earl Grey Tea by Davidson's - 8 sachets - Superior black tea from India combines with natural oil of bergamot for a classic, rich tea blend. Cheddar Herb Biscuit Mix by Stonewall Kitchen - 12 oz. - These flaky buttery biscuits are delicious eaten on their own or used to make a gourmet breakfast sandwich. Strawberry Tea Wafer by The Original Carlsbad Oblaten - 1 oz. - Ultrathin tea wafers that are infused with all-natural strawberry flavors. Wild Maine Blueberries by Highland Sugarworks - 3.5 oz. - Tiny hand-raked wild blueberries that are packed in water for freshness. Traditional Scone Mix by Stonewall Kitchen - 14.37 oz. - This delicious mix allows you to bake rich, fresh scones in no time at all. Oatcake Biscuits by Effie's Homemade - 7.2 oz. - Light and crisp oatcake biscuits that are slightly sweetened, making them perfect for snacking. Berry Essence Tea by Davidson's - 8 sachets - This herbal tea blends Rooibos with organic rosehips and hibiscus for fruity tartness, then a touch of cinnamon for just the right sweetness. Pistachio Biscotti by Cucina & Amore - 6.3 oz. - Classic Italian cookies are delicious on their own but even better when dunked into a cup of coffee. GourmetGiftBaskets.com has an amazing selection of gourmet gifts that everyone will surely love! Springtime Tower of Treats by GourmetGiftBaskets.com is as beautiful as it is delicious! I love sweets and have a huge sweet tooth so this Springtime Tower of Treats was right up my alley. I also love that it was large enough to share with the whole family. The cake pops were divine! I love how incredibly moist the inside was and how perfect the decorated chocolate shell on the outside was. It's the perfect combination. 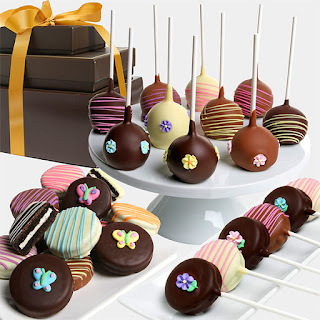 The chocolate covered Oreo pops and chocolate covered Oreo® cookies were also heavenly. I think just about everyone loves Oreos but cover them in chocolate and they become a whole new delicious treat that is sure to please just about anyone. Springtime Tower of Treats by GourmetGiftBaskets.com would make a terrific gift this Mother's Day or any other spring occasion! 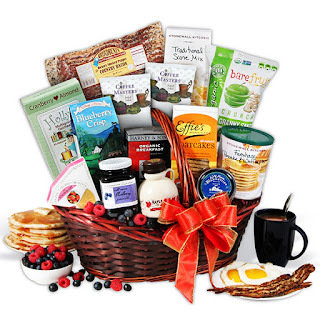 The Ultimate New England Brunch Gift Basket by GourmetGiftBaskets.com is definitely the ultimate brunch gift basket. It comes with everything you need for the ultimate brunch and looks incredibly beautiful all packaged and ready to be gifted. 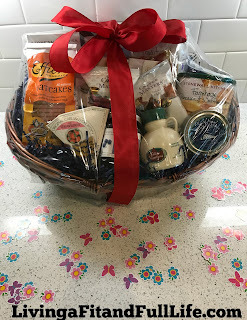 The Ultimate New England Brunch Gift Basket by GourmetGiftBaskets.com would make a marvelous gift for mom this Mother's Day! After gifting it to her, stick around and use the ingredients to make her a gourmet brunch that all moms dream of. Complete with family and a gourmet brunch, the Ultimate New England Brunch Gift Basket by GourmetGiftBaskets.com is the perfect way to celebrate Mother's Day! GourmetGiftBaskets.com is a terrific place to shop this Mother's Day or any other occasion and is sure to please!